Libertarian's Forum › Libertarian's Forum › Freedom Forum › The World's Most Massive Military Is Getting Bigger In 2020! The World's Most Massive Military Is Getting Bigger In 2020! It's like a Saturday Night Live skit - I thought is was a joke at first. It's very real. Veep Mike Pence announced that another branch of the Military will be added in 2020. It will become the SIXTH US Military branch. it is the first new branch of the armed services to be created since 1947. 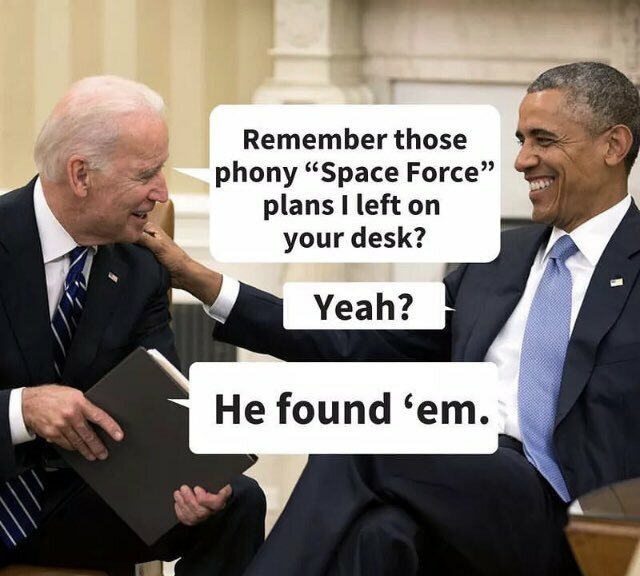 There is also talk of yet another military branch - United States Space Command which would be completely independent of the Space Force. These new Military branches will need Congressional approval, of course. I think they'll get it - the lawmakers in Washington are completely mad. If there were no Income Tax, none of this nonsense would be happening. Re: The World's Most Massive Military Is Getting Bigger In 2020! Our enemies are stepping up their game. The strategy used in Afghanistan won't work with China or Russia or some combination of radical extremist progressive governments. We'll never have to worry about "boots on the ground", or flag-draped caskets being offloaded from a C-5. If they can keep the communications satellites in operation, they are priceless. To make sure that it works, we must not assign the task to bureaucrats or their cronies. Really chief? Is it possible that the intent of that went over your head? That's the first complimentary thing you've ever posted about Obama/Biden. Obama announced today that embassies will be re-established in Havana and Washington. The action is mostly symbolic, but it may serve to help normalize relations between the US & Cuba. Obama doesn't provide any clues about how this may impact trade with Cuba, but I'm hoping he would like to normalize that as well. I think we're on the right path by normalizing travel and trade policies with Cuba. Its a win-win scenario. Everyone benefits. Any step closer to Liberty is a step in the right direction. For Cubans and Americans. Old Glory once again proudly flies outside the American Embassy in Havana. Last time she flew in Havana was in 1961. There's no point in punishing an entire nation for the misdeeds of one man (Castro). Another baby-step toward Liberty. Hey.. let's take 'em when we can get 'em. I have praised Obama in numerous posts regarding his efforts to normalize relations with Cuba (reopening the embassies). US imperialism will never be out of fashion. Anything you've said in the past must be taken with a grain of salt. You've turned 180 on Trump and talked down Obama so much that it's negated any praise you could have spoken of. In any case, that stands out as a change of heart on your part. Or a misunderstanding of the intent. Or maybe you just needed to find something that mocked your V.P. and you thought is was worth it even though it reflected positively on Obama/Biden?